Adam Nisenson is a contemporary artist who uses textiles and movie/commercialism poster vinyl to create abstract expressionistic compositions. A self-taught painter and successful graphic designer, Adam merges these two worlds into his compositions. In college, Adam began dabbling with found objects, clothing and everyday commercialism as an artistic medium. Some of his first pieces revolved around old advertising materials and denim jeans. 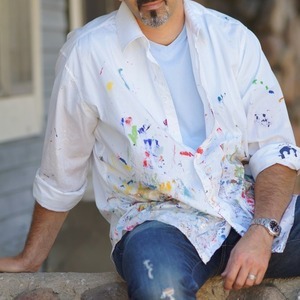 Adam pursued a Fine Arts degree with an emphasis in graphic communication, which he forayed into a successful career first as a graphic designer, then as an entrepreneur and marketer. For 16 years he owned and operated an award-winning design/marketing agency in Houston, Texas with as many as 12 employees. There he merged his passion for art with the advertising world, and worked with such companies as ESPN, NBC Sports, Pepsi, PGA Tour, Houston Astros and Texans as well as many others in the sports and entertainment world. Rediscovering his love for found objects with a focus on reusing items that would otherwise be discarded, Adam dove back into his art and started to study the works of Jackson Pollock, Andy Warhol, Robert Rauschenberg and Willie Cole. In 2008, Adam sold his firm and moved to Los Angeles where he launched his art studio. Since that time, he has brought to life old ideas that he played with while in college using everyday items of commercialism and textiles, crafting his technique of reinventing movie poster and commercialism vinyl and every day fashion into new compositions. Adam's creativity is not only limited to his art, he still designs, consults and has written a book about archetypes and storytelling in the sports marketing arena entitled Captivate, which is available on Amazon.com. He currently lives, works and plays in Los Angeles with his wife of 18 years and his son.